Christmas 1955. From left to right, David Eisenhower, John Eisenhower, First Lady Mamie Eisenhower, President Dwight Eisenhower, Susan Eisenhower, Barbara Eisenhower, and Anne Eisenhower. Photo courtesy of the National Park Service (Abbie Rowe). Beginning this holiday season, visitors to the Gettysburg National Military Park Museum and Visitor Center may see the Nativity scenes made in Bryn Athyn for the Eisenhower White House. In 1954 Raymond and Mildred Pitcairn commissioned Winfred S. Hyatt to make a single Nativity scene for President and Mrs. Eisenhower. It was displayed in the East Room of the White House that same year, next to the Christmas tree. Two more scenes were added in 1957. Thanks to a generous grant from the Gettysburg Foundation, visitors to the Museum and Visitor Center at Gettysburg National Military Park can now view three newly-conserved Nativity scenes that President Dwight D. and Mamie Eisenhower displayed during the holiday season in the East Room of the White House. The scenes were commissioned by Raymond and Mildred Pitcairn of Bryn Athyn, Pennsylvania, and handcrafted by artists Winfred Sumner Hyatt and Hanna Weil Fischer-Binder, with additional work done by Raymond Pitcairn’s Bryn Athyn Studios. Figure 1: The White House Nativity scenes will be at the Gettysburg National Military Park Museum and Visitor Center through December 31. The exhibit is free and open to the public. Photo: Ed Gyllenhaal. The White House Nativity scenes are similar to several other three-part Nativities made in Bryn Athyn, including one made for the Pitcairns now on exhibit at Glencairn Museum. Raymond Pitcairn (1885-1966) was living with his wife and family at Cairnwood, his childhood home in Bryn Athyn, when he commissioned Winfred Hyatt to design and build the family’s three-part Nativity in the 1920s. Hyatt was the principal stained glass artist and designer for Bryn Athyn Cathedral and later Glencairn. In addition to the Nativity scenes made for the Raymond Pitcairn family, Hyatt went on to make similar scenes for Bryn Athyn Cathedral, the Harold Pitcairn family (Raymond’s brother) and, in the 1950s, the Eisenhower White House. Figure 2: Mildred Pitcairn at Glencairn with her grandchildren in 1967, in front of the Nativity made for the Pitcairn family in the 1920s by Winfred S. Hyatt. Photo courtesy of the Glencairn Museum Archives. Winfred Hyatt, the son of a New Church minister, was born in Toronto, Canada. In 1908 he came to Bryn Athyn to enter the Academy of the New Church Boys School. He later attended the Pennsylvania Academy of the Fine Arts, winning two Cresson traveling scholarships during his time as a student there. A letter written by Raymond Pitcairn to Hyatt during the beginning of his work on the family’s Nativity scenes indicates his desire that historical accuracy be taken into account. Pitcairn was also involved in the design process, writing to Hyatt, “I should like to go carefully over the arrangement” (January 15, 1924). Hyatt modeled all the figures, which were then cast in plaster, painted, and clothed. The story of the Nativity is depicted from left to right: the first scene is the Annunciation to the Shepherds; the second portrays the Nativity; and the third shows the wise men gazing at the Star of Bethlehem. These same scenes, in the same order, also appear in the Eisenhower Nativity. Figure 3: Bryn Athyn artist Winfred S. Hyatt, principal stained glass artist and designer for Bryn Athyn Cathedral and later Glencairn, made three Nativity scenes for the Raymond Pitcairn family during the 1920s. Hyatt also made Nativity scenes for Bryn Athyn Cathedral, the Harold Pitcairn family (Raymond’s brother), and the Eisenhower White House. Photo courtesy of the Glencairn Museum Archives. Each December the three scenes were placed in front of the Pitcairns’ fireplace in the parlor hall at Cairnwood. The Nativity was always considered to be the most important element in the elaborate decorations of the hall, which included festoons of fir garlands and a large Christmas tree. The decorations were not seen by the Pitcairn children until Christmas morning, a common custom in households of the period. A simple black wooden railing was placed in front of the Nativity so the younger children would not be tempted to handle the delicate figures. The Nativity moved with the family to their new home at Glencairn in 1939, and continues to be displayed annually during Glencairn Museum’s World Nativities exhibition. Figure 4: The Annunciation to the Shepherds, one of the Nativity scenes from the Eisenhower White House now on exhibit in Gettysburg. Photo: Ed Gyllenhaal. The Pitcairns were active supporters of Eisenhower’s presidency, having played a leading role in the Bryn Athyn “Eisenhower for President” petition drive in 1951. (Ten years later, in 1961, the Eisenhowers visited Glencairn to thank the borough for its support.) In 1954 Raymond Pitcairn commissioned Winfred Hyatt to make a single scene of the birth of Christ for President and Mrs. Eisenhower. Hyatt and several craftsmen from Pitcairn’s Bryn Athyn Studios produced the cabinetwork and landscaping, while Hanna Binder, an artist from Bucks County, Pennsylvania, carved the human figures from wood. Pitcairn had encountered Binder’s work in 1948 at the Art Alliance Christmas sale. He commissioned Nativity sets for his children, and chose Binder to carve and dress the human figures for the Eisenhower Nativity. Employees of the Pitcairns were sent to the White House to set up the figures in the scene. The Nativity was displayed in the East Room of the White House that same year, and two more scenes were added in 1957. Figure 5: The Christ Child, Mary, Joseph and the shepherds; one of the Nativity scenes from the Eisenhower White House now on exhibit in Gettysburg. Photo: Ed Gyllenhaal. The Eisenhowers wrote to the Pitcairns several times to thank them for their gift. In 1956 Mamie wrote to Mildred, “Your beautiful creche is decorating the East Room by the Christmas tree and on Saturday I stood beside it to greet two hundred children of White House employees” (December 27). The following year Mamie wrote again to Mildred, “This gift from you has added much to our last two Christmases, not only to our family’s enjoyment, but also to that of the many visitors who see it during the daily tours of the White House” (October 8, 1957). Figure 6: The Christ Child, Mary, and Joseph; one of the Nativity scenes from the Eisenhower White House now on exhibit in Gettysburg. Photo: Ed Gyllenhaal. Figure 7: The wise men gazing at the Star of Bethlehem; one of the Nativity scenes from the Eisenhower White House now on exhibit in Gettysburg. Photo: Ed Gyllenhaal. 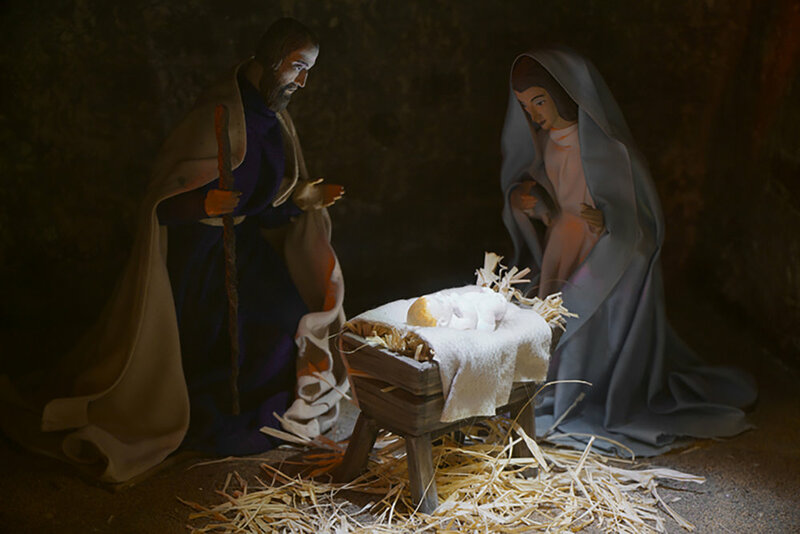 In 1994, with major church renovations underway, the Gettysburg congregation loaned the Nativity scenes to the Eisenhower National Historic Site for display. They were donated to the National Park Service permanently in 1998, but were displayed for only two years because of sustained damages. Early in 2010 Ed Gyllenhaal, curator of Glencairn Museum, began a correspondence with Michael R. Florer, the curator at the Eisenhower National Historic Site. The Eisenhower Nativity was at that time being stored in a small storage facility on the edge of one of the battlefields. Archival materials relating to the Nativity scenes, including letters exchanged between the Eisenhowers and Pitcairns, were located in the Glencairn Museum Archives, and an exchange of information took place. Figure 8: Carol Hegeman, supervisory historian at the Eisenhower National Historic Site, speaking at a celebration of the installation of the White House Nativity scenes at the Museum and Visitor Center in Gettysburg. According to Hegeman, “These Nativity scenes were so important to the Eisenhowers that after being displayed in the White House from 1954 to 1960, Mamie gave them to a local church, the Gettysburg Presbyterian Church, for continued display and enjoyment. We are pleased that we can continue that tradition of displaying them each holiday season.” Photo: Ed Gyllenhaal. In 2014 the National Park Service and the Gettysburg Foundation worked with Art Guild, Inc., in West Deptford, New Jersey, to conserve the scenes, which included the reproduction of missing figurines, lighting repairs, securing exhibit cases, producing exhibit labels and overall structure restoration. A celebration of the installation of the Eisenhower Nativity took place at the National Military Park Museum and Visitor Center on December 15, with representatives in attendance from the National Park Service, the Gettysburg Foundation, the Gettysburg Presbyterian Church, the Pitcairn family, and Glencairn Museum. Figure 9: Representatives from Bryn Athyn at a celebration of the installation of the Eisenhower Nativity at the National Military Park Museum and Visitor Center. From left to right, Brian Henderson (director of Glencairn Museum), Kirsten Hansen Gyllenhaal (museum researcher at Glencairn Museum), Lynn Pitcairn Genzlinger, Ken Schauder, and Glynn Cole Schauder. Lynn and Glynn are granddaughters of Raymond and Mildred Pitcairn. Not pictured: Ed Gyllenhaal (curator of Glencairn Museum). Photo: Ed Gyllenhaal. The exhibit will be on display in the lobby of the Museum and Visitor Center through December 31, and is free and open to the public. According to Gettysburg Foundation President Joanne Hanley, “We are thrilled to have the opportunity to once again share these historic dioramas with the public and further educate our visitors about the life and legacy of President and Mrs. Dwight D. Eisenhower.” They will be displayed each holiday season. Figure 10: Interpretive signage for the White House Nativity exhibit at the National Military Park Museum and Visitor Center. Photo: Ed Gyllenhaal. In addition, visitors are encouraged to visit the Eisenhower home during its annual holiday celebration. The home will be decorated for Christmas, December 1-31, 2014, as it was done by Mamie Eisenhower nearly 40 years ago. It is open daily with shuttle buses leaving the Gettysburg National Military Park Museum and Visitor Center at 10:00 a.m., 11:30 a.m., 2:00 p.m. and 3:30 p.m. Admission is $7.50 for adults, $5.00 for youth ages 6-12, and free for children aged 5 and under. Advance reservations are available and highly recommended for groups. To make reservations, please call 877-874-2478 or visit www.gettysburgfoundation.org. The Pitcairns’ personal three-part Nativity is part of Glencairn Museum’s annual World Nativities exhibition. For many Christians the Nativity scene is a meaningful expression of religious faith, providing a compelling visual focus during the Christmas season. World Nativities reveals how artisans around the world have adapted the Nativity scene to represent their own national, regional, and local cultures.